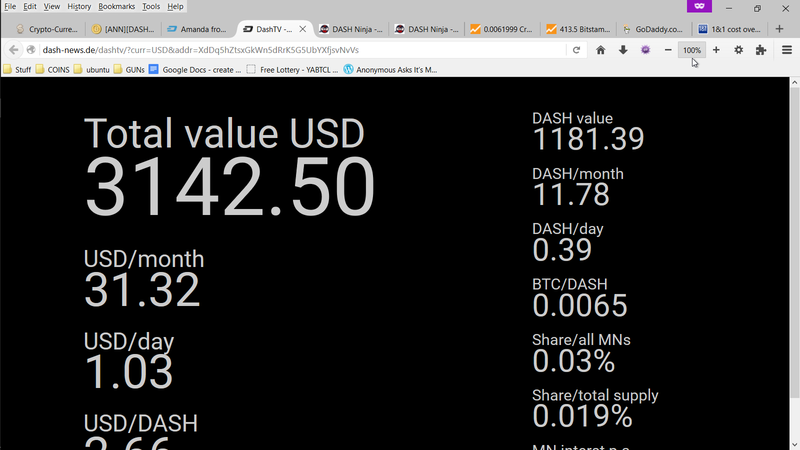 I always felt there has to be tool where I can check all the data (most important fiat value) of my Dash addresses on one screen. Ok, time to renew some html/css/js/php "skills". So here is what I got, maybe useful for some of you too. Put it onto your RasPi like me, onto your smartphone, 2nd screen, big TV in the entry hall of your villa, whatever. Dash- and fiat-data gets refreshed every minute, the value of your addresses once an hour. MN count is calculated automatically (yourDash/1000). Default parameters are: 1000 Dash (1MN) and USD as fiat currency. Special thanks to: mjsrs for his api, UdjinM6 for his help and the dash block explorer api. Thank you very much, thats a nice amount for a small fish like me, I really appreciate it The time will come when I have to change the layout for you because your total value run out of space And I have to add separators. What's the resolution of your screen? I can scale it down for higher resolutions. And yes, it means per annual. Changed the viewport for resolutions wider than 1290px. Btw: you can toggle the BTC price with the "B"-button on your keyboard now. but............can we get it in browser size also? you could try using some sort of html/css framework like bootstrap or foundation5 then you can present all this very wonderful info in a beautiful responsive mobile and browser ready interface. They provide most of the markup as well. pille I'm not seeing the current Dash price on DashTV. My screen says .0063 but the Poloniex price ATM is .00649. Where does your service get price info? I will see what I can do, this layout is only a first try for my (awaiting) 3.5 inch raspberry pi screen and my old 4:3 ratio monitor, widescreens could be problematic at the time. Meaby use the worldcoinindex price? Can you take the price of poloniex + 12 requests per hours from WCI put it on spreadsheet and take the medium info from there? At least it would be more acurate.... what do you think? Sorry to complicated splawik21. Price is from Polo now (only BTC, not fiat). What you should keep in mind: every url you enter on the domain dash-news.de will be logged by the server (I dont have a root sever -> can't change that). That means, if you don't want to have your addresses stored connected togther anywhere, use the value attribute! Why don't you take the requests and cache it locally? that way when folks run to your site with a valid request you can hit your local cache. Albeit only allowing it to be refreshed every x interval ? Is there a place on the page where you could have it display total BTC worth? I'm lazy. This is great ! I can finaly easy monitor my incomes from work I have 2 screens at work so this is great! Is there any posibillity to change background color / text colour ? Is is under construction maybe ? USD price from Poloniex is nonsense because of it's low volume (28 Dash/ last 24h). I calculate with Dash price from Polo and BTC price from https://dash-stats.firebaseio.com/stats.json , should be reasonably accurate. Better compare with coinmarketcap.com for example.